Olympia, the archaeological gem of the Peloponnese, allows us to journey back in time and relive the magic of its historical origins, the dawning of sports ethics and its ancient culture. The kids will be able to feel like athletes from ancient times and challenge each other in an event similar to the Olympic Games of Ancient Greece. A unique occasion for young and old alike! 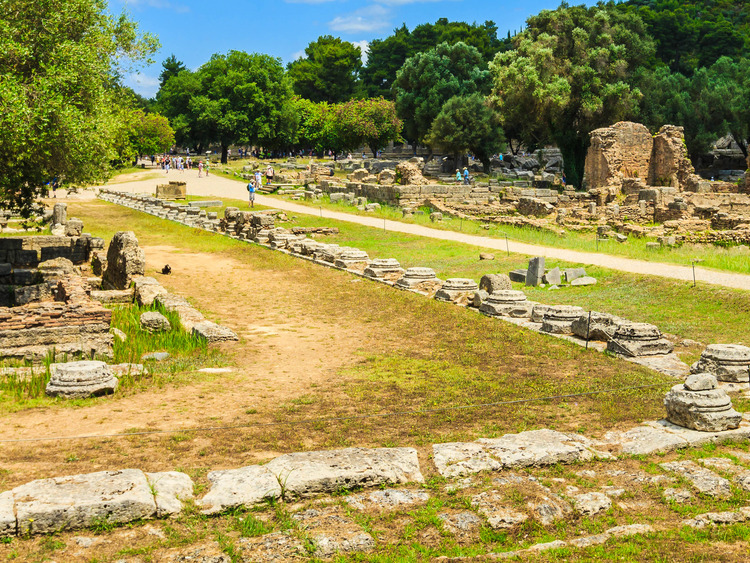 An expert guide awaits us at Olympia to take us on a discovery tour of the ancient city, where the remains of temples, statues, public buildings and the homes of priests and athletes bear witness to the pomp and ceremony of the past. Lying in a valley along the River Alfios in north-western Peloponnese, Olympia held the famous Olympic Games in honour of Zeus every four years. Here in 776 BC, a list of winners was drawn up for the first time, presumably the results of the very first Olympics in history. As we stroll around ancient Olympia amongst the archaeological excavations, it feels as though we can still hear the spectators shouting to encourage the athletes and breathe the festive atmosphere which accompanied those 5, very long days, during which the best athletes challenged each other in the various sports: wrestling matches, charriot and horse races, the pentathlon and pankration (a primitive form of boxing). Let's delve into the past and discover the little secrets of the competition which was first accessible only for male athletes of Greek origin and was later opened up to young Romans. Perhaps not everyone knows that women and slaves were banned from the town, the sanctuaries and the terraces, at the risk of a terrible death by being thrown from a nearby cliff. After our exciting tour of the excavations, the kids can feel like athletes from Ancient Greece and challenge one another in an event similar to the ancient Olympic Games, to relive the fun of the past. The winner will be crowned according to ancient tradition with an olive branch, the kotinos, in honour of Zeus, the father of the Gods. Before we end our excursion, all the children will be given a certificate of participation to remind them of this unforgettable day when they competed "not for the prize, but for the honour".